With the NHL trade deadline nearing the Vancouver Canucks have taken a player off the market. VANCOUVER — With the NHL trade deadline nearing the Vancouver Canucks have taken a player off the market. The Canucks signed defenceman Erik Gudbranson to a three-year contract extension Tuesday. The team said the deal will carry an average annual value of US $4 million. "It took a little while, got into crunch time, but I am very happy today," Gudbranson said after the Canucks' morning skate prior to facing the Colorado Avalanche Tuesday night. The length of the deal was important for the former first-round draft pick. "I have been on three straight contract years so having a little stability is huge for me and my family," he said. "From the get-go it was a three-year deal. I knew that is kind of what I was in the ballpark for. They came at me with that, so it ended up being a good deal. I think it works for both sides." The 26-year-old was scheduled to become an unrestricted free agent at the end of the season. With the rebuilding Canucks mired near the bottom of the standings, there was a debate in Vancouver hockey circles whether the organization should keep the six-foot-five, 224-pound Ottawa native or maybe trade him for a prospect or draft choices. Gudbranson said he recently had a long talk with head coach Travis Green about Vancouver's road to improve. "We just had a good conversion about the direction the team is going and what his views are, and they fit like a glove with what I thought this team is going to be like in a couple of years," he said. "It's an exciting task to be in a group like this and be able to grow with is so I am very fortunate to be here." Green said Gudbranson, who is called Guddy by his teammates, is a physical player who makes life difficult for opponents. "I don't think skill players enjoy playing against him," said the Canucks' rookie coach. "I don't think we have seen the absolute best in Guddy's game. I think he is a guy that is still improving. I think we need to push him to be better. I think we have seen some of that this season." Gudbranson agreed there is room for improvement. "I can get better," he said. "There is a lot of work to be done. I'm still a sponge like I was when I was 19-20 years old, trying to pick guys brains and use the vets to my advantage. "I don't know what the ceiling is. I don't think anyone really knows but I am just trying to get better every single day and that's my motivation." Gudbranson doesn't agree with the theory a rebuild means jettisoning any older players for a youth movement. "A rebuild is not nuking the whole system and bringing 24-25 new guys in," he said. "There is a transitionary period. "These kids that are coming in nowadays, they are extremely talented, they are fast, and they have a lot of skill, but they still need guidance and I think that's important." 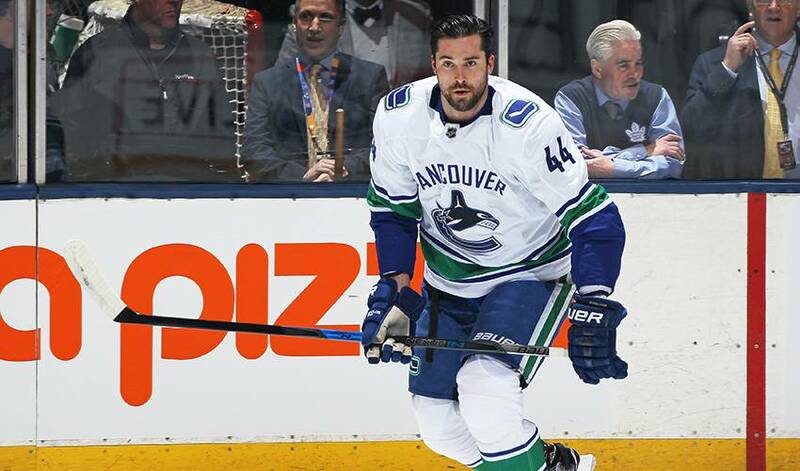 Vancouver general manager Jim Benning said Gudbranson is another piece in the Canucks puzzle. "Erik is an important part of our team and provides a physical element to our blueline," Benning said in a statement. "His leadership qualities help us as we continue to integrate younger players in our lineup. "He is a quality person, a great teammate, outstanding in the community and we are excited to have him as part of our team moving forward." Gudbranson was picked third overall by the Florida Panthers in the 2010 NHL draft. He was traded to the Canucks in May of 2016 in a deal involving Jared McCann. Gudbranson has two goals and two assists in 41 games this season. In 380 career games with Vancouver and Florida, he has 14 goals and 39 assists. Gudbranson missed 52 games last year with wrist surgery and 12 this season with a shoulder injury. "The Canucks have treated me really well," he said. "I didn't forget about how they treated me through my wrist injury and how they took care of me. "I think we have taken a step forward this season with bringing some young guys in and playing some good hockey. I think the future is bright and that was a big reason I wanted to be here." Gudbranson has been paired with Alex Edler lately and played in a shutdown role. "I think the last two months I have started to feel really comfortable," he said. "The pairing I am part of right now gives me a little more purpose on the back end. "Stuff like that gets me going. It excites me making guys' nights miserable. I have been able to do that, and I feel comfortable out there." The Canucks have also recalled goaltender Richard Bachman from their AHL affiliate, the Utica Comets.